Photo Front Row, L-R : Yonathan Shraga, OJCB Senior Chaplain Rabbi Israel Hirsch, Chaplain Dara Abaei, Captain Ralph Ornelas, State of California Department of Corrections Senior Officer Yonatan Berdugo, OJCB Director/Senior Chaplain Howard Winkler, OJCB Senior Chaplain Rabbi Shimon Raichik. 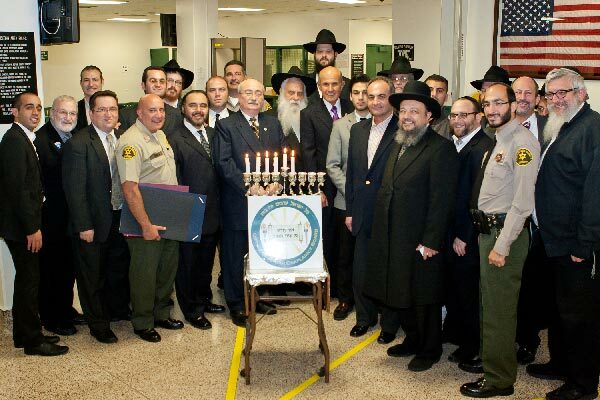 Sheriff Lee Baca, Shai Abishoor, Nick Niksefat, OJCB Senior Chaplain Rabbi Gavriel Cohen, Chaplain Rabbi Gavriel Hershoff, LASD Reserve Deputy Ari Sabbagh, Rabbi Yankee Raichik, Back Row, L-R: Moshe Hirsch, Eli Seleh, West Coast Director of the Aleph Institute/OJCB Chaplain Rabbi Zvi Bojarski, Farshad Goharseenai, Lieutenant Elior Morejon, Councilman Michoel Bloom, Bruce Bloom, Moshe Jacobs, Rabbi Uri Weitz, Gregory Metzger, Rabbi Leon Diner (partially hidden). The Orthodox Jewish Chaplaincy Board (OJCB) of Southern California conducted its Chanukah candle lighting with Jewish inmates at Men’s Central Jail (MCJ), Twin Towers Correctional Facilities (TTCF) and Pitches Detention Center (PDC) during various nights of Chanukah. On the fifth night of Chanukah the OJCB held a Chanukah celebration at the Men’s Central Jail prior to visiting the inmates. Los Angeles County Sheriff Lee Baca, Correctional Services & Custody Operations Division Chief Alexander Yim, Inmate Services Bureau Director Karen Dalton, DrPH, CJM, and other high ranking members of LASD who have all been helpful to the efforts of the OJCB and who assure that all inmates of all religions are able to observe their religious rights during their incarceration were present as the OJCB bestowed awards upon those who have performed their duties in an exemplary manner and to those who have assisted and supported the OJCB and the inmates who are being served by them. MCJ Captain Ralph G. Ornelas and TTCF Lieutenant Elior Morejon were recognized for their outstanding assistance, continued support and endorsement of the OJCB. Both Cpt. Ornelas and Lt. Morejon have been extremely helpful and have gone out of their way to accommodate religious practices for all inmates in general and for the Jewish inmates in particular. Inmate Services Bureau Director Karen Dalton and Lieutenant John Hunter accepted awards on behalf of the Religious & Volunteer Services Unit for their professional management of the programs performed by the OJCB. Rabbi Zvi Bojarski is the West Coast Director of the Aleph Institute, a Florida Based Chaplaincy organization working with Jewish Inmates in many different jails and prisons throughout the country and Rabbi Gavriel Hershoff who is the Executive Director of Aish Tamid of Los Angeles, a multi-faceted outreach and crisis intervention program for teens and young adults in our community were recognized for their outstanding professional assistance, continued support and endorsement of the OJCB. Both Rabbi Bojarski and Rabbi Hershoff are active OJCB Chaplains at the L.A. County Jails. Michele Lelah, CPA who works with Attorney/CPA Yosef Manela, was honored for her support, commitment and dedication to the OJCB. They handle all OJCB financial and legal matters. Elinor Marks-Gordon, LCSW who is Director of the Holocaust Survivor Program at Jewish Family Services (JFS) of Los Angeles was honored for her support, commitment and dedication to the OJCB. The OJCB is exploring the possibility of setting up an “Adopt-A-Holocaust-Survivor” program in conjunction with JFS where Jewish high school students develop a relationship with and visit Holocaust Survivors at least once a week especially those with no immediate family members living close by. All honorees and awardees present, as well as the OJCB, received commendations from United States Congressman Brad Sherman, the L.A. County Board of Supervisors, Sheriff Lee Baca, Mayor Antonio Villaraigosa, L.A. City Councilman Paul Koretz, and the OJCB. Sinai Glatt Kosher Catering (RCC Glatt) graciously hosted the event with a gourmet buffet dinner consisting of a variety of salads, hot entrees, assorted cold cuts, potato latkes with apple sauce and jelly doughnuts. Immediately following the Awards Event the Chaplains, Assistant Chaplains, and Volunteers of the OJCB fanned out to visit the Jewish Inmates. Together they lit candles, ate jelly doughnuts, sang, danced and uplifted their neshomas and brought them Chanukah light and joy! The OJCB is in desperate need of soft cover seforim and other appropriate reading materials, Hebrew/English, Hebrew/Farsi and English only. All books must be new or in good condition with no notes or anything written inside. A tax deductible receipt will be sent to all contributors. Send your tax-deductible contributions to: Orthodox Jewish Chaplaincy Board, P.O. Box 480454, Los Angeles, CA 90048.